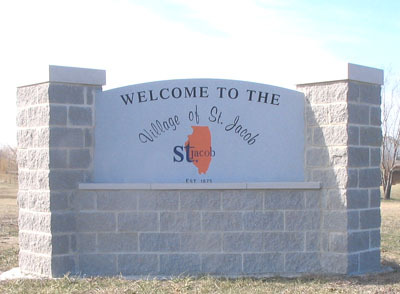 Welcome to the Village of St. Jacob! St. Jacob Illinois is a quiet community with an abundance of open spaces and small-town atmosphere, as well as family oriented community values. Set in the rural landscape of Southwestern Illinois, our small Village lets you step back in time to a place that is perfect to raise children or just enjoy the peacefulness of quiet streets and great neighbors. In St. Jacob you will find business that are locally owned and managed such as the State Bank of St. Jacob and Home Telephone and Entertainment. This local ownership will ensure that you will receive the kind of personal service and support that your coworkers in St. Louis and other communities will only look at with envy and disbelief. Other local shopping districts, as well as doctors, hospital and other professional services can be found within five miles of St. Jacob by visiting either the cities of Highland to the east or Troy to the west. The Triad school district also offers one of the finest public educations in the state of Illinois. The district consistently ranks as one of the best, and provides a local neighborhood school located in the heart of the Village, as well as a modern high school that is just 4 miles west of town. While residents pride themselves with the small town values that are found in everyday life, they also enjoy the luxuries of a modern and thriving metropolitan region. Located 25 miles east of downtown St. Louis, residents are only twenty-minute drives from major sporting events, shopping centers and entertainment districts, as well as the many other amenities that a major metropolitan region would have to offer. Located within ten minutes of four major interstates, St Jacob is an easy commute to almost anywhere in the metropolitan area and is quickly becoming the perfect place to call home. Don't forget to like the Village of St. Jacob Official Facebook page!